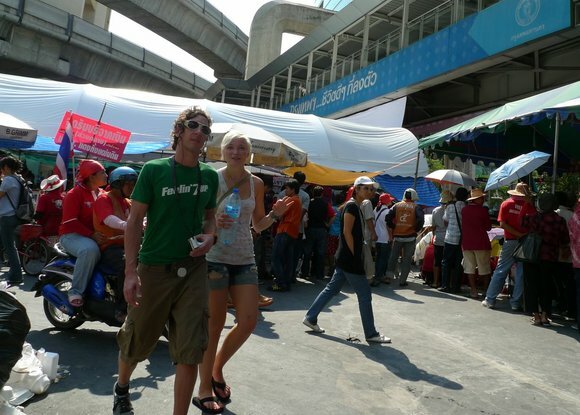 (BANGKOK) Every cloud has its silver lining and, so it would seem, every crippling protest has its tourism promotion scheme. 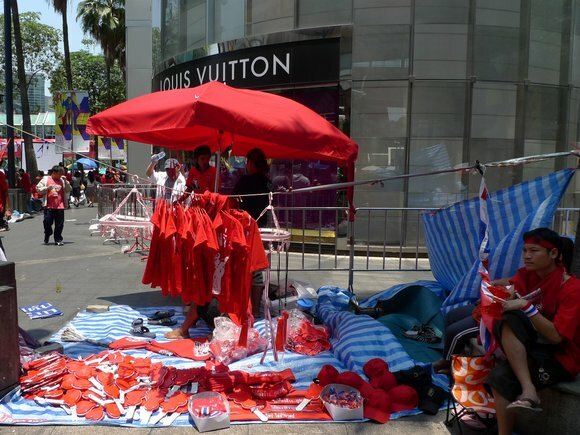 In the four weeks since thousands of anti-government protesters, known as “Red Shirts” although they have increasingly donned other colors so as to confound the fashion police, shut down the high-end Ratchaprasong shopping district, tourism arrivals to Amazing Thailand have plummeted more than 40%. The result has been hundreds of millions of baht in lost business every day as hotels and shopping centers have been forced to close. But a creative solution, it seems, may soon be at hand. A view along the new pedestrian mall, showing both the food and crafts tents and the screen for outdoors showings of classic Thai films. Working feverishly to restore the confidence of global tourists and to prop up the thousands of affected jobs in the service and tourism sectors, Bangkok Governor Rodtitmakmak Naimahanakorn and Tourism Authority (TAT) Governor Naktawngtiaw Maimatungprathet held a joint press conference yesterday to announce the creation of the Ratchaprasong Pedestrian Mall and Issan Folk Festival. Soon the Ratchaprasong Pedestrian Mall will be filled with tourists from around the globe. Following recent efforts by New York City mayor Michael Bloomberg and San Francisco mayor Gavin Newsom, both of whom have changed the faces of their respective metropoleis by turning previously busy streets into pedestrian-friendly plazas, the governor explained the Bangkok would finally join the ranks of world-class cities that are friendlier to their citizens than they are to their citizens’ cars. Vendors along the Pedestrian Mall will offer handcrafted local merchandise in a wide range of colors. 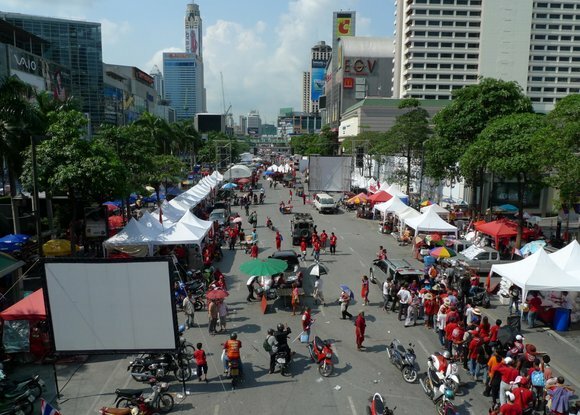 As to the question of how opening a pedestrian mall along what was formerly Bangkok’s ritziest shopping district will help the tourism slump, TAT Governor Naktawngtiaw expressed confidence that adding a cultural twist would attract global attention. 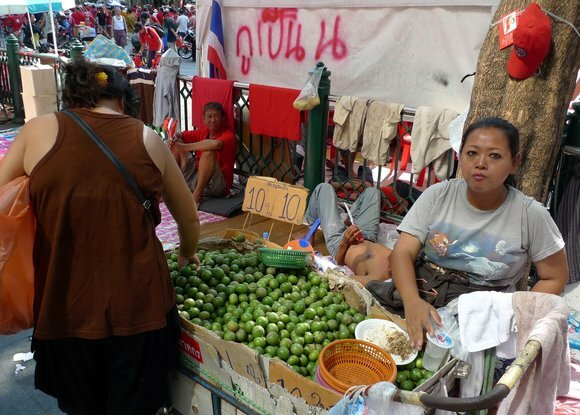 Above, vendors at the Ratchaprasong Pedestrian Mall will offer Issan specialties including fresh-squeezed lime juice with soda, a refreshing Northeastern Thailand treat. Of course, this entry is strictly a farce, a bit of humor to help the residents of the City of Angels deal with the frustrations and inconveniences brought on by the continuing protests. No direct quotes were taken and no offence intended! This entry was posted in Uncategorized and tagged Bangkok, Farce, Humor, Krungthep, politics, Protests, Red Shirts, Thailand, UDD by christao408. Bookmark the permalink. Actually, this sounds like a good idea, just like the farmer’s market here in some of the L.A. suburbs which is held during certain day of the week, looks exactly the same as photo no.1. Farce or not, I think pedestrian malls are great ideas. Even the little mall in front of the White House on Pennsylvania Avenue is a welcome retreat from the busy streets of DC, small as it may be. Why can’t they send tourist to those alleyways in Chinatown? Assuming Patpong 1 and 2 still exist, aren’t they uhm… pedestrian only? (not that I would know)Well – I hope it helps the businesses. This was good. Sounds like a great idea. So silly. I love it! An optimistic solution! Now what is this about soda with lime juice?? Isn’t that called Sprite?